The World Gold Council recently released a report titled “China’s gold market: progress and prospects” examining the rising demand for gold in the world’s most highly populated country. The report also explains why China’s gold market will continue to expand regardless of the giant surge in demand. Important to the trend is China’s growing middle class, which is expected to grow by over 60% (200 million) to a total of 500 million in the next six years. For comparison, consider that the total population of the United States currently stands at about 319 million. The people of China are also experiencing higher real incomes, more money in private savings, and urbanization. Urbanization: China has reached 170 cities that have a population of more than one million. The middle class in these cities is currently at 300 million people, which may grow to 500 million in six years. These individuals have more disposable income and limited options for investment, which will drive up demand for gold amongst them. Savings: Chinese bank accounts currently hold an estimated $7.5 trillion. Amidst rising prices of homes and lackluster alternative savings options, gold is a stable investment. The Chinese also prefer physical gold over all other forms (a smart move), and new gold investment options are coming out. Jewelry: After almost tripling in size over just a decade, China has quickly become the world’s largest jewelry market, accounting for 30% of all global demand. These numbers are only expected to go up from here. Electronics: Industrially, gold is most commonly use in electronics, which have seen a huge demand increase in China in the past couple of years. China also holds the most gold-related patents, such as one for nanogold used in healthcare. Holdings: At the end of 2013, China became the world’s sixth largest holder of gold bullion, meaning gold makes up 1% of the country’s official reserves. 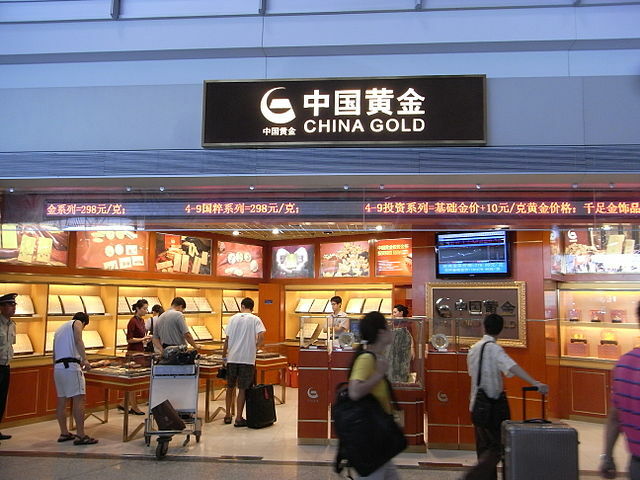 Investors are speculating on whether the Chinese government has increased gold holdings. There are different factors that can affect gold demand: population, urban expansion, disposable income, supply, and industrial and aesthetic uses. Remember what higher demand usually means for prices? It raises them, and many investors are viewing China’s production and consumption of gold as a foreshadowing of its long-term future. On the global market scale, considering China’s massive population, the effects of their higher demand on gold values will likely be felt worldwide. If you believe gold is a long-term investment that will hold its value for years to come, consider setting up a Gold IRA with American Bullion to secure your retirement money. It’s tax-free, hassle-free and your application can be completed online in under 10 minutes. Call 1-800-326-9598 to speak with a gold specialist today.